Collector Joseph Webb, a fan of "Suspense", has been kind enough to share some rare discs from his collection of the program. Program 74 of the series as it was heard on Armed Forces Radio, and originally broadcast October 19, 1944, is "Eve" starring Nancy Kelly. The date is from the disc matrix. We continue to double our pleasure and double our fun with "twin" versions of the same "Suspense" episode. In the previous post, I outlined the questions behind this mysterious disc set. In this post, what I'm calling "version B" of "Overture in Two Keys", a "Suspense" episode originally broadcast January , 1947 on CBS, sponsored by Roma Wines and featuring Joan Bennett and Howard Duff. As I mentioned in the last post, I'm unsure if these two versions of the same program represent "East" and "West" coast broadcasts of the program or if one or both are rehearsal recordings. If you listen closely, or open up the two files in the left and right channel in an audio editing program, you can easily hear that they are different performances. In version A, heard in the previous post, the actors perform the dialogue at a slower pace - listen to the difference in the pause between the two versions after Bennett's opening dialogue and the scene at the train station around the 2:00 mark. At the end of version A, you heard a promo for "The FBI in Peace and War" at the end of the show - this is missing from version B. In addition, in version B, listen to the strange sound (like a baton hitting against a music stand) at the end music, just after the announcer says "keep you in suspense" and the coughing by someone in the background after the CBS network id. Version A, in the previous post, sounds like the performance heard on an mp3 of the show that's been floating around the web - you can download it for comparison from the Internet Archives. That recording appears to have been made from a later generation tape copy, since the sound isn't quite as clear and there's some cross-channel cross talk on that version. Of course, we don't know what transcription that version came from. Our mp3 of Version B of the program was transferred from an original Radio Recorders lacquer transcription set cut for the Biow Company, an advertising agency that produced "Suspense" at the time. The file has undergone editing to eliminate skips and click reduction to improve the sound since the disc set is deteriorating and starting to crack. Please note that I'm offering this file up in a higher bit rate than normal for posts to the blog because of the wide interest in the "Suspense" series in the otr community - be patient if you're on a slower Internet connection. Please post your comments if you know something of the ins and outs of production practices of the time or similar "Suspense" transcriptions and might have some thoughts on what these two versions of the program might be. And now ... a tale of Suspense. And a mysterious transcription set. A couple of weeks ago, two "Suspense" transcription lacquer sets came up for bid on ebay. One was for a missing episode of the program, "The Burning Court", with Clifton Webb. The other, from the same source, was for the January 16, 1947 episode, "Overture in Two Keys" with Joan Bennett. A group of us pooled resources to bid on the missing episode, but we missed out on it at the last minute - it went for over $400. However, I did win the Joan Bennett episode. Although it's currently in circulation, I thought it might be a different copy in better condition or perhaps an aircheck that might have some local commercials or station ids at the beginning and end of the program, similar to the "Bing Crosby Show" discs I obtained a few months ago. When the discs arrived, they were actually something rather unexpected - two different versions of the same program. There are two discs in the set, one containing "part one" on each side of the program and the other containing the matching "part two" of the shows. Each disc has a label mentioning the series name, date and the notation "Eastern". (The photo of one label is in this post and the other label is in the next post.) All four sides contained labels at some point - you can see the glue residue - but two of the labels are missing. However, I'm certain that the labels are mixed up - they've been reattached with tape. Also, the labeled sides don't match - the two versions of the show have different side breaks, so you can tell which sides originally went together. I'm not sure if the two versions of the show are the live broadcasts done for the East and West Coast, whether one is a broadcast version and one a rehearsal, or if both are rehearsals. Did "Suspense" do two live broadcasts for different time zones at this point in its history? The disc labels mention the Biow Company, which was the ad agency that packaged and produced the series for Roma Wines. The fidelity of them tells me that they were either recorded in the studio or via a very high quality network line. I'm assuming they were produced as a reference or legal record for the advertising agency and/or sponsor. According to back issues of "Billboard" magazine, available at Google Books, some other network programs that Biow produced for the networks included "Lights Out", "The Life of Riley", "Crime Doctor", and "The Henry Morgan Show". They also packaged "The FBI in Peace and War", which is promoted at the end of this "Suspense" episode, and were involved in an early little tv sitcom you might have heard of - "I Love Lucy". This episode of "Suspense", "Overture in Two Keys", was originally broadcast January 16, 1947 on CBS and was sponsored by Roma wines. The show features Joan Bennett as the main star, but radio stalwart Howard Duff has the juiciest role as an up and coming composer in love with another man's wife, complete with an emotional mental breakdown. Chew up that scenery, Howard! Joan Bennett, making her first appearance on "Suspense" in this episode and receiving a complimentary basket of Roma wines for her efforts (and perhaps a bit of a paycheck), had a career spanning from the silent era to television. You probably know her for roles in movies like "Little Women", "Scarlet Street" and "Father of the Bride". Younger whipper snappers have seen her work in the horror tv soap opera "Dark Shadows" and the cult Italian horror movie "Suspiria". It took me a couple of evenings to transfer and restore the recordings. Both discs were starting to deteriorate, leeching that annoying white powder that coats lacquers as the coating starts to break down. The lacquer coating on the "part two" disc was starting to crack and skipped quite a bit in the first couple of minutes, particularly on what I'm calling "version A" heard in this post - there's a few bits of dialogue missing because of the complicated skips I couldn't overcome. Please note that I'm offering these two versions of the show in a higher bitrate than usual, due to the broad collector interest in "Suspense", so they make take some time to download if you're on a slower connection. Feel free to post your comments and thoughts about these recordings - I'd be curious to hear from anyone that has similar Biow/Radio Recorders "Suspense" disc sets and if the labels give more information that might clear up this little mystery. And, to the person who won the discs containing the previously lost "Suspense" episode with Clifton Webb - what's on your discs and what are the labels like? You can send me an email in confidence, if you like. I won't mention who you are in the blog. In the next post, "Version B" of "Overture in Two Keys" and some notes on the differences between the two versions of the program. Since Thanksgiving is coming up, I was trying to think of a way to connect this week's shows with a holiday theme. I suppose the only way this one might fit is that it makes you thankful you're not on the window ledge of a high-rise building with a mad doctor trying to kill you. In this post, "Suspense", originally broadcast April 19, 1951 on CBS and presented as program 365 in the "Suspense" series on Armed Forces Radio. Jimmy Stewart plays a businessman who is drawn into helping a young woman who says she is being pursued by a doctor that's trying to kill her. The circulating copies of this show are missing the last ten minutes. (This would lead me to believe that they're dubbed from a network copy of the show that was given to one of the staff or performers or done as an aircheck on 12" 78 rpm discs and that one of the discs is missing.) This version of the show is complete - a real treat since this particular episode of "Suspense" has an ending that relies on sound effects and great acting to create a tense climax to the story. The show was dubbed directly from an AFRS vinyl disc. There's a couple of sections with pops in the disc, but the sound is quite good otherwise. I'm a big fan of "Suspense" and feel quite lucky to have obtained a few AFRS transcriptions of the series for my collection. Here's another early episode of the program, "The Cross-Eyed Bear", originally broadcast sixty-five years ago this week on September 16, 1943. 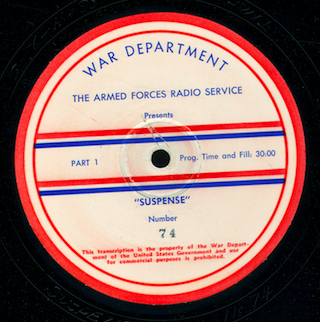 It was distributed as program 21 in the "Suspense" series by the Armed Forces Radio Service. The show stars Virginia Bruce as a young woman that's hired for a job that turns out to be more than she bargained for. Like many early "Suspense" programs, they were still struggling with finding the right style for the shows - this one has a plot that's probably a bit too complicated to be as gripping as later scripts in the series, but it's still well done. The transfer is direct from an original Armed Forces Radio vinyl transcription. Here we offer the very first performance of "Sorry, Wrong Number" with Agnes Moorehead from the CBS series "Suspense", originally broadcast May 25, 1943. This version is the one heard by our Armed Forces on AFRS in 1943 as program number 8 in the "Suspense" series. I posted a later performance from the following year in a previous blog entry. This first performance contains a "flub" at the end where the sound effects person makes a mistake and the actor who plays the killer gets mixed up. The end of the show confused listeners and, the following week after many letters and phone calls, the producers of "Suspense" started the program with a special announcement explaining how the episode ended. There are some MP3 files floating around that are labeled as "east coast" and "west coast" versions of the episode, with the "east coast" version containing the mistake and the "west coast" version done properly. The "west coast" version is actually a fake - someone tacked on a correctly done ending from a performance done months later. "Sorry, Wrong Number" was only presented once on May 25, 1943 on the network and it was not repeated at a special time for west coast listeners. The show was transferred from an original AFRS vinyl pressing in nice condition. Get a load of the AFRS announcer doing the opening with the echo chamber. In this post, "Wet Saturday", originally broadcast December 16, 1943 on CBS's "Suspense". The episode is a very British black-humored story about a murdered curate and a cast of eccentrics who may have killed him. The show stars Charles Laughton and also features character actor Hans Conreid trying out his best British accent. This is the AFRS version of the show, distributed as number 30 in the AFRS "Suspense" series. "Wet Saturday" reminds me a bit of one of Hitchcock's lesser-known films, "The Trouble With Harry". There's the whole premise of having a kind of "mixed up" murder, but also a kind of droll attitude about the killing that makes it seem like something rather bothersome and inconvenient. According to the Goldin index, the story was performed on "Suspense" in 1942, 1947, and 1948 in addition to the 1943 version heard here. The program was transferred from an original AFRS vinyl disc. The AFRS opening announcer is our old friend Howard Duff and there's a five minute classical music fill at the end of an unknown work conducted by Donald Vorhees. Update, August 8, 2009: I've posted a new version of the mp3 file for this notable broadcast. David Kiner graciously agreed to run CEDAR sound reduction software on the original .wav file of my transfer, so the original unaltered mp3 file has been retired. In addition, a full quality version of the CEDAR restored mp3 has been made available through the Old Time Radio Researchers Group distribution of "Suspense" at archive.org. On this blog and podcast, I've focused on presenting original transcription discs from my collection, most all of programs that are not in circulation among collectors or are very uncommon. Thanks to an estate auction on ebay, I'm pleased to offer a "world premiere" of sorts for the Web of an elusive and highly sought-after program. Unheard publicly since September 30, 1943, we bring you Orson Welles starring in "The Lost Special" a "tale well calculated to keep you in ... Suspense!". Originally broadcast on the CBS radio network, but now lost, the version heard here was distributed by the Armed Forces Radio Service as program 24 in the "Suspense" series. "The Lost Special" is based on a Sir Arthur Conan Doyle story and concerns a train that mysteriously disappears. The story was also used on the series "Escape" on February 12, 1949, so it may seem familiar. (You can give it a listen here.) However, in the "Suspense" version, the story is told by the main character and framed as a broadcast by a condemned man that will reveal the identity of persons responsible for certain crimes. The grease pencil mark near the opening is on the music cue just after the "Suspense" announcer says "... anything, however strange, that will hold our listeners in ... Suspense!" Strange, since this cuts out the entire opening that sets up the "show within the show" format. Orson Welles appeared in the series "Suspense" eight times between 1942 and 1944 in such classics as "The Hitchiker and "Donovan's Brain". One of Welles's performances, "The Lost Special", was thought to be one of about thirty-five "Suspense" programs missing out of over 900 broadcast during the run of the series. If you're a member of the otr mailing list, you've heard about my finding "The Lost Special" in an ebay auction a few days ago. If you're wondering if I'm going to be selling the disc, I'm not. I collect for the enjoyment of the shows and discovering something new. The disc is a unique find that needs to find its way to an archives someday. I'm offering "The Lost Special" as part of my podcast in an unrestored medium-quality MP3 that's optimized for downloading or listening on the website. I'm investigating the best way to offer it to the OTR community on a CD or high quality .WAV file and to get the sound restored with more advanced tools than I have, so stayed tuned for more info. Hope you enjoy the show. In the mean time, if you know of some old transcriptions scurried away somewhere, send me an email. You never know what might turn up in an old stack of records! *Entry corrected, 6 May 08 - Inserted corrected info on Howard Duff. In this post, "Suspense" from February 24, 1944, broadcast on AFRS as program 41, "Sorry, Wrong Number" starring Agnes Moorehead. "Sorry" has been circulated by OTR fans for years and is one of the all-time classic episodes of the series and, indeed, of old time radio in general. This episode circulates in a CBS network version; here, you can give a listen to how the show was presented to troops overseas, including a preview of next week's show to fill out the time at the end. This particular episode was the third performance of "Sorry" on "Suspense". Moorehead performed the story eight times during the run of the series, the first on May 25, 1943 and the last on February 14, 1960. Some listeners really dislike "Sorry, Wrong Number", finding Agnes Moorehead's performance "shrill" and "over top" and the show unpleasant to listen to. I really think that's the beauty of the script and a facet of the character that Moorehead understands that made the show so popular that it was repeated many times over the run of the "Suspense" series - Mrs. Stevenson is utterly unlikable and the script plays with our sympathies (or animosity) towards her. I read somewhere that Lucille Fletcher got the idea for the show after hearing an obnoxious woman in line at a store, demanding service and indignant that she was being treated improperly. Fletcher sets up the character as demanding, whiny and shrill - the type of person that would test the patience of any telephone operator and, even more, the patience of her husband. As the program progresses and the potential murder story becomes more clear, we have either one of two reactions. We either feel more sympathy for Mrs. Stevenson, realizing the situation she is in and the frustration she feels. Or, as in my case when sometimes listening to the show, you think, "Man, I wish she was the one being killed - she's annoying!" Of course, if you feel for Mrs. Stevenson and understand her terror, the ending is frightening and disturbing. If you can't stand Mrs. Stevenson, the ending is satisfying and exhilarating. If it hasn't been done already, someone could do a fun parody of "Sorry, Wrong Number", where the telephone operator storms in to murder her for being such a nuisance and not looking up and dialing her own damn telephone numbers. Here's an example of how an OTR show can sound if it's taken from an original master that luckily survives in good condition. It's also an example of an unreleased screw-up by Armed Forces Radio. "Suspense" was a long-running CBS thriller series and this episode, "My Dear Niece", was originally broadcast on January 24, 1946. The story concerns an elderly woman that is held captive by a killer and features Dame May Whitty. You may also recognize Raymond Johnstone Brett Morrison, who was the voice of The Shadow over on Mutual radio, in the role of a police investigator. This transfer was taken from an original rejected test pressing from AFRS, where the show was distributed as program 139 in the Suspense series. My guess is that the pressing was rejected because of the speed variance problem in the opening of the show. Circulating copies of this Suspense episode sound pretty bad; here's an opportunity to hear it in near hi-fi quality.